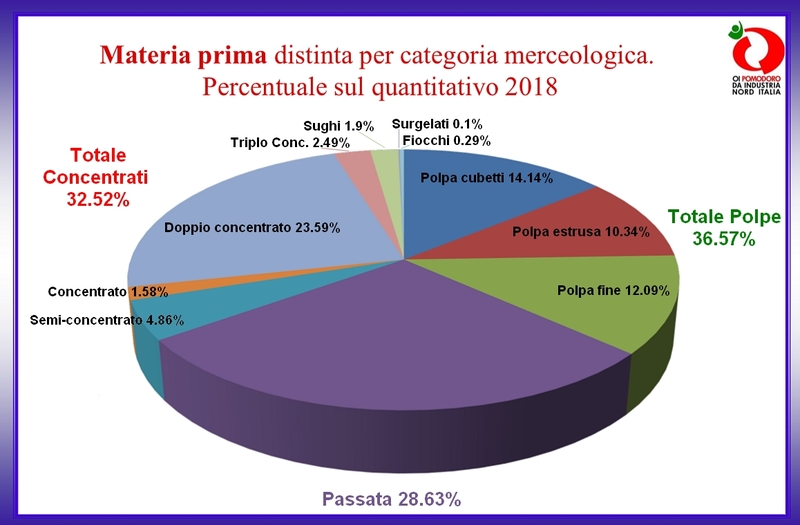 The 2018 season's results in Italy have recorded a further drop in terms of finished products compared to last year: according to the Pomodoro Nord Italia IO, total production of tomato products has fallen by 8.5% this year, compared to 2017, as a consequence of the big drops in the production of chopped and pulped products (-34.6%), pastes (-17.8%) and passata (-5.3%). 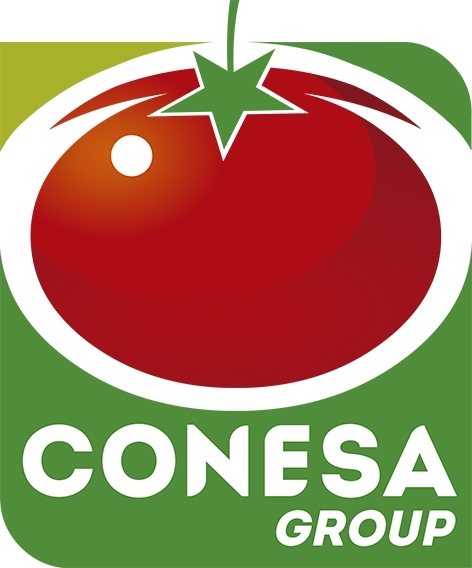 The processing tomato season in the North of Italy ended with a major drop in volumes of finished products. 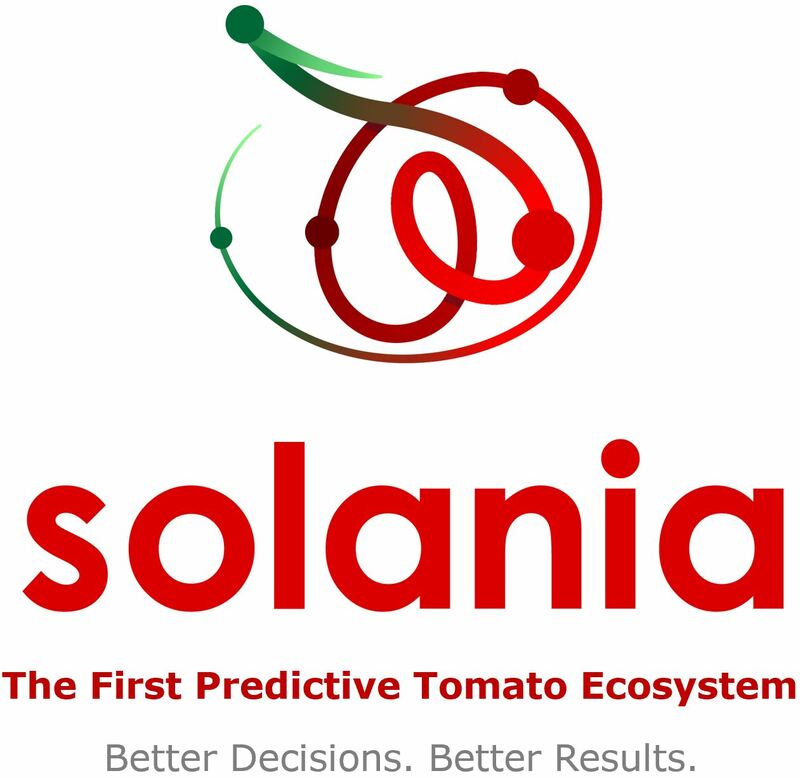 Data collected by the IO – the interbranch organization for the processing tomato sector of northern Italy – has confirmed an 8.5% drop for tomato products overall (mainly pulps, pastes and passata) compared to production in 2017. 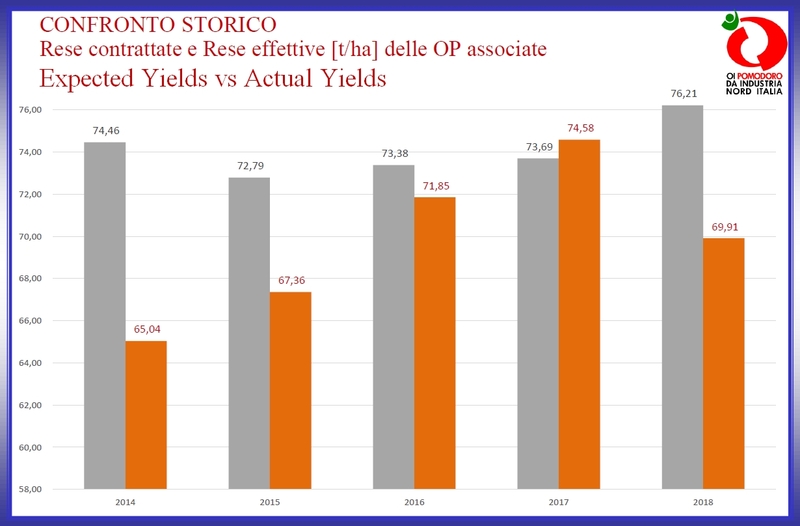 Italian "finished product" results have dropped from 1 246 758 tonnes in 2017 to 1 141 110 tonnes in 2018. For Tiberio Rabboni, president of the Pomodoro Nord IO, "the drop in quantities of finished products is the direct consequence of a decrease in planted surfaces, which was included in the targets set during the negotiation phase, and of a harvest season that has been hit by a number of climate events leading to a further drop in the volumes shipped to processing plants, compared to what was originally stated in the contracts. This decrease has continued the downward pattern already recorded last year (a drop of 5.3% in the total volume of finished products in 2017 compared to 2016), which we know was linked to the excessively low average Brix value of the quantities harvested and delivered to factories, with processing operations leading to a final production that was below usual expectations for the same quantity of raw materials. 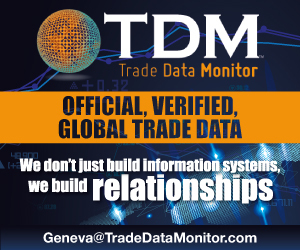 The results of the 2018 season in the north of Italy are nonetheless similar to what they have been in the South Central region of the country, and they correspond to a pattern that has seen a major contraction of worldwide results, particularly in countries like China, Spain and Portugal. This can only serve to stimulate the much-needed and renewed vitality of market dynamics." 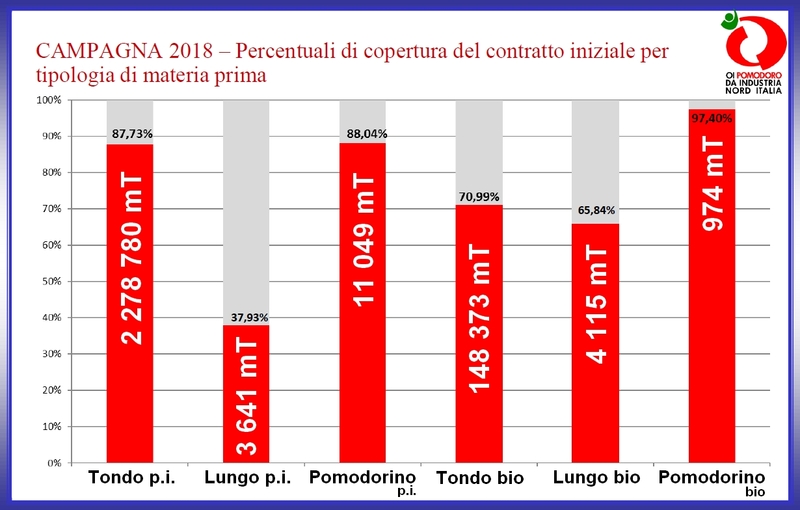 Amongst the most significant decreases, the report published by the Pomodoro Nord IO has underlined a big drop in the paste category (which fell from 187 966 tonnes last year to 154 423 tonnes this year), which is all the more noticeable for the fact that production during the 2017 season had already dropped 20.9% compared to 2016. In a detailed breakdown, the product segments that have been most impacted by this drop in volumes are triple-concentrated pastes (-38.5% compared to 2017) and semi-concentrated pastes (-34.6%), followed by pastes themselves (-11.3%) and double-concentrated pastes (-3.8%). Major contractions have also been recorded for volumes of chopped pulped products (-34.6%, from 358 281 tonnes in 2017 to 245 787 tonnes in 2018) and passata (-5.3%, from 362 302 tonnes last year to 345 096 tonnes this year). On the other hand, the organization has nonetheless pointed out that this year's production has been of higher quality, as witnessed by the average weighted content of soluble solids, with a Brix degree at 4.78, which is higher than in 2017 (4.67) and has led to better industrial yields. The 2018 season in the North of Italy started on 16 July and ended on 11 October. According to final and consolidated data provided by the IO, a total of 2 818 721 mT had been contracted this year, of which 2 573 879 mT have actually been delivered to plants. Due to particularly adverse weather conditions, to hailstorms that damaged crops, to the high proportion of early ripening caused by unstable weather, and to infestations of red spiders (Tetranychus) in the province of Parma, the quality of shipments delivered to factories gave rise to a relatively high percentage of penalty deductions (more than 13%), resulting in 2 446 932 mT being paid to growers, with the crop being processed in 28 plants belonging to 21 different companies. Agricultural production was badly affected by adverse weather conditions, with this year's yields (69.9 mT/ha) being well below expectations (76.2 mT/ha) and also below results recorded during previous seasons (74.58 mT/ha last year and 71.85 mT/ha in 2016).